For just about everyone, a few saw cuts in the road aren't very exciting, but for the KVT project team the cuts made along Cortland Place on Wednesday 10/14 represented a major step forward for the project. The gas line relocation along Cortland Place NW and Devonshire Place NW (referred to below as Phase 4) will feed the new gas line currently being installed along the Klingle Trail, and it will eliminate an existing feed pipe that crosses Klingle Creek behind the Woodley Park Towers. The crossing feed pipe, shown below, has been exposed for several years due to the heavy erosion along Klingle Creek. 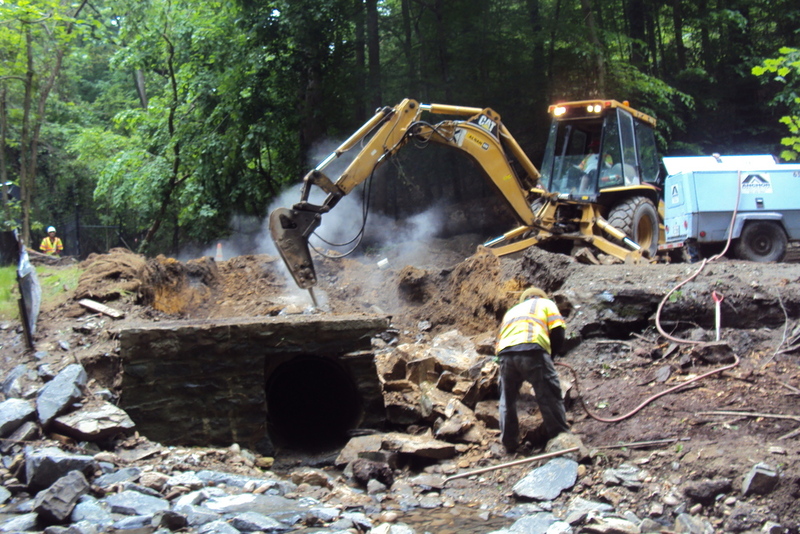 Removing the pipe is key to our stream restoration work and ultimately to the trail. Meanwhile, crews continued working west on Phase 1 relocation this week, with another 150 feet of pipe installed. In other news, Klingle Creek stream restoration work is ready to begin! Our stream restoration contractor will mobilize to the site in the next two weeks and will start the stream work during the first week of November. Washington Gas made good progress this week despite work being suspended during the Papal visit. The crew worked on approximately 200 feet of trench and pipe during the week, including installation of an 80-foot section of pipe on Tuesday. Washington Gas performed its deepest excavation and pipe placements to date this week, with trench depths exceeding ten feet from street level. This has to be done for the gas line to avoid existing storm sewers as well as new drainage structures that will be installed as part of the Klingle Trail. Also, utility regulations require all new gas lines to have a minimum one foot vertical clearance from water and sewer pipes. For deep excavations, the gas line contractor must employ additional safety measures, including shoring boxes when trench entry is required, steel plates for temporary trench coverage, and remote-controlled compaction equipment. Washington Gas is approximately 1/3 complete with Phase 1 of the gas line replacement as of September 18th. Despite the shortened Labor Day work week, Washington Gas installed 100 linear feet of gas line. Subsurface conditions changed from the difficult solid rock encountered last week to softer, easier to excavate soils. 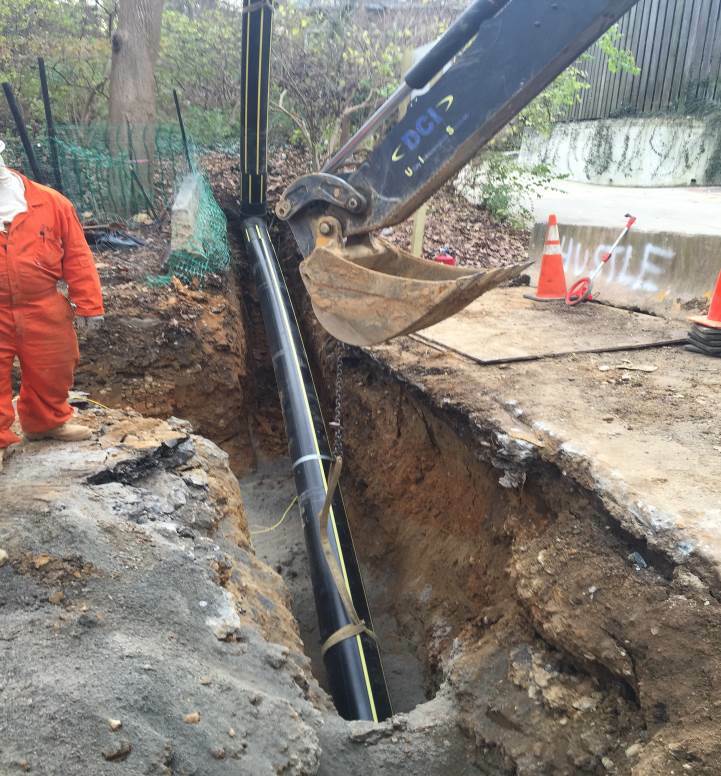 DDOT and Washington Gas continued to work together this week to adjust the gas line as needed to avoid the maze of existing underground storm drains and utility pipes. For those who were wondering, the KVT project was not affected by the mineral oil spill that was discovered along Klingle Road NW over the Labor Day weekend. The damaged PEPCO pipe was east of Rock Creek, and contamination was limited to Rock Creek and areas downstream of Klingle Creek. The steep grade of the Klingle Valley also prevents any upflow from Rock Creek. 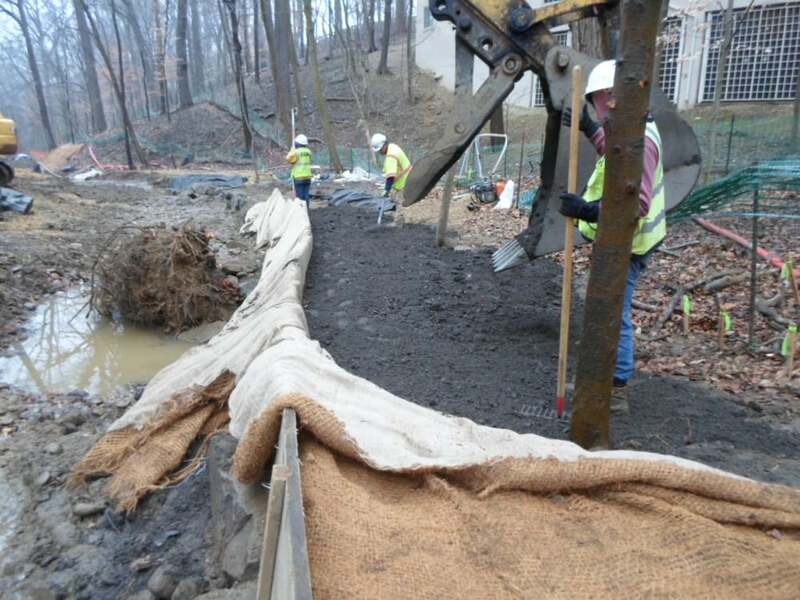 Over the weekend emergency environmental remediation crews installed two temporary dams just east of the project limits in Rock Creek to contain the mineral oil contamination. Washington Gas Phase 1 line replacement continued this week, moving west of Connecticut Avenue and away from the difficult subsurface conditions below the bridge. On Monday, Washington Gas fabricated a 90-degree pipe section and tied it into the existing gas line with a valve just to the east of the Connecticut Avenue Bridge. A permanent valve was installed along the new gas line on Tuesday, which was then backfilled and topped with asphalt. The asphalt is a temporary erosion control measure and will be removed during trail construction. New gas line tied into existing line using the 90-degree pipe with a valve just below the Connecticut Avenue Bridge. Crew backfilling and compacting stone dust around new gas line. Existing utility lines and stormwater pipes are always a challenge in urban construction, and Klingle Road is no exception. Washington Gas encountered four separate pipes in its trench path this week: a terracotta drain pipe from the Connecticut Avenue Bridge, an abandoned steel gas pipe, a concrete sanitary sewer pipe, and another lateral storm drain pipe. Excavating around these existing lines is delicate and difficult work. As the pipe crew progressed away from the bridge, the gas line trench was outside the Klingle Road footprint. Since pavement breaking was not needed, Washington Gas was able to excavate 75 linear feet of trench on Thrusday and Friday. Washington Gas Phase 1 replacement continued this week. 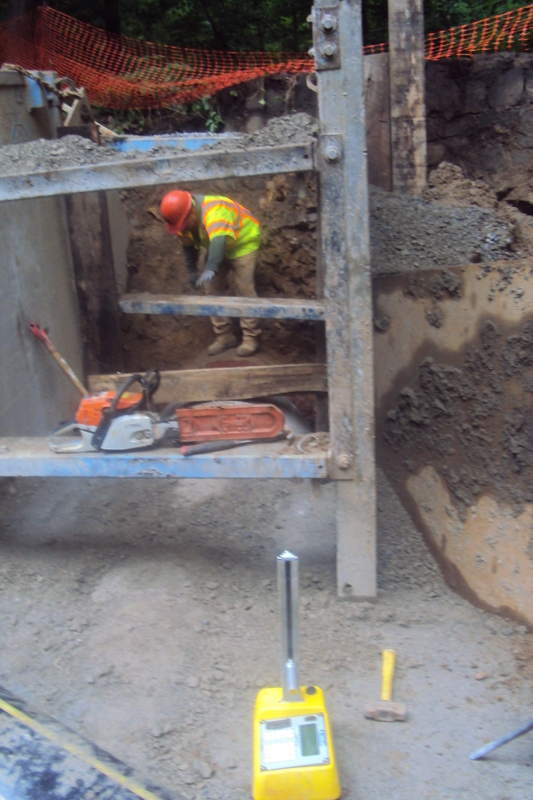 Pavement breaking, trench excavation, and gas line pipe backfill took place underneath the Connecticut Avenue Bridge. All pipe was verified to be at a sufficient depth to not interfere with the upcoming trail work. 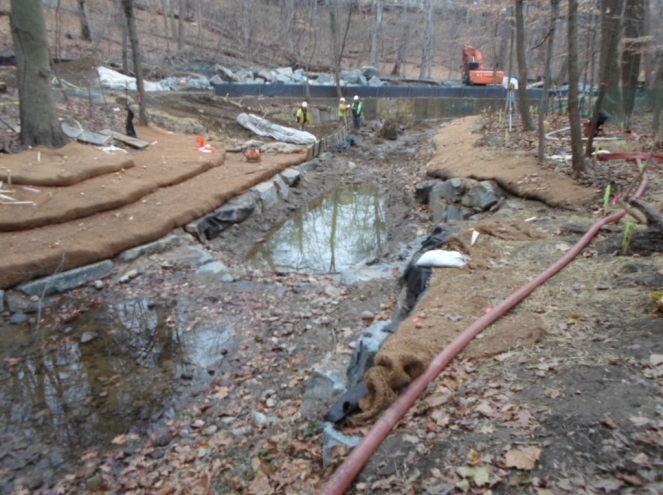 Anchor Construction placed riprap in the sump at proposed structure MH-2 along the Tregaron Conservancy property. The existing structure was removed last week and the existing pipe, nearly 90 years old, was partially unclogged using hand tools. The pipe now conveys drainage from the Tregaron property to Klingle Creek where in the past drainage would bypass the pipe and flood Klingle Road. The pipe to Klingle Creek will be fully cleaned prior to structure installation later this year. Washington Gas installed safety shoring just east of the Connecticut Avenue Bridge north abutment for valve installation. Anchor Construction performed maintenance on the west trailhead construction entrance. The stone and concrete rack will allow crews to wash vehicles and prevent mud tracking on the street. Click here to view the weekly progress report for the week ending August 7, 2015. Click here to view the weekly progress report for the week ending July 31, 2015. Click here to view the weekly progress report for the week ending July 24, 2015.